Asthma and Exercise | Houshang Farhadian M.D Inc.
Copyright© 2009, 2019, H. Farhadian, MD. All rights reserved. About 12.5 million Americans are suffering from some degree of asthma. About 80 percent of the time, their condition is hereditary. That means that, in 80 percent of the cases, we find some of the family has been suffering with asthma or allergies. The severity of asthmas varies from mild to sever and can even be life threatening. This condition is characterized by episodes of shortness of breath, tightness of the chest, wheezing, cough and phlegm. In some cases, the person only suffers a persistent dry productive cough. Three significant changes are noticeable in a lung biopsy: inflammation, spasm of the bronchial tubes and an increase of mucous secretion. The following factors initiate or aggravate asthma: Pollen, house dust, animal hair and dander, smoke (first and second hand), air pollen, strong odors like perfume, food odor, aerosol sprays, change of temperature, atmosphere, and altitude pressure, stress, and some viral infections. Bacterial infections, especially sinusitis, could aggravate or trigger asthma. One of the most important factors are over exertion and intense physical activity. More than 70 percent of asthmatic patients can exacerbate their condition by too much physical activity. However, a certain percentage of patients develop symptoms only during or after exercise. This condition is called exercise-induced asthma. 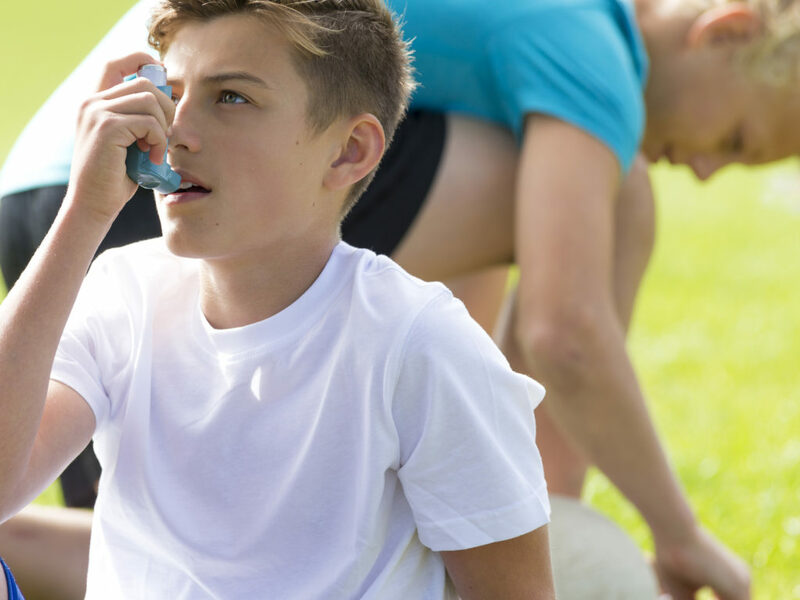 The cause of exercised-induced asthma is not known. It is speculated that during exercise, water evaporates via the respiratory tract and heat is lost through excessive breathing. Loss of water and heat cause both spasm of the bronchial tubes and, therefore, feeling of shortness of breath and wheezing. Now, the question is should people who suffer from exercise-induced asthma, or whose asthma worsens or triggers from exercise, stop physical activity? The answer is no. The majority of the cases can be controlled by different techniques and medications. If the patient has allergies, by performing a skin test we can find the allergen or offending agent that is causing asthma and then, if possible, avoid the specific agent. If this is not possible, the person can be desensitized against that allergen (the agent that causes allergy) so that the person becomes immunized to those specific agents. Also, asthma should be treated by medication that opens the bronchial tubes, such as Beta-2 agonists. However, the main drugs today are anti-inflammatories, like cromolyn or nedocromil. These medications are used for prevention. Use of these inhalers one hour before physical activity usually would enable the person to perform without having an asthma attack. Therefore, people who enjoy physical activity may be able to do so by taking these medications without changing their lifestyles. There are Olympic athletes who may continue their physical activity successfully by taking medications. This is a hopeful message to all individuals who suffer from asthma who would like to continue exercising.